Seniors with dementia often withdraw from their friends and families, which gives them fewer opportunities to keep their minds active. Getting them to engage in certain activities can significantly increase their quality of life by stirring fond memories, encouraging self-expression, and alleviating anxiety. If your elderly loved one is living with dementia, Harrisburg, PA, senior care professionals recommend 5 activities that may provide the soothing sensory stimulation he or she needs. Music can be a powerful tool for inciting memory recall. Play one of your loved one’s favorite songs and encourage him or her to sing along. It’s also vital to pay attention to how your loved one responds to changes in stimuli. Families providing Harrisburg, PA, dementia home care should be mindful of the fact too much loud noise could cause agitation. Cooking is another great way to keep your loved one engaged. Have your loved one help with a small task during meal preparation. The comfort and familiarity of this important routine can help soothe depression and anxiety while making him or her feel more confident, capable, and valued. Gardening is an excellent form of stress relief, and it can also provide your loved one with an ample amount of regular exercise. Being outside in the fresh air is cathartic for many seniors with dementia. In fact, gardening is often used as part of structured dementia therapies to promote recall and minimize behavioral issues. If your loved one used to be meticulous about housekeeping before developing dementia, he or she may take to organizing and cleaning tasks with enthusiasm. Much like cooking, housekeeping involves the repetition of familiar routines. Tasks like sweeping the floor or organizing office supplies can provide the sense of accomplishment and pride your loved one needs. Painting and other creative projects are great for encouraging self-expression. In fact, engaging in creative hobbies may help your loved one vent challenging emotions in ways that aren’t otherwise possible. Keep these projects simple and stress free to limit frustration and consider setting up an art table in a peaceful outside area. 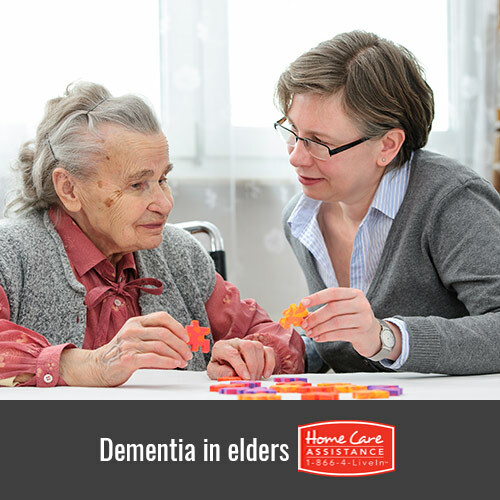 To ensure your loved one gets plenty of mental stimulation, reach out to Harrisburg Home Care Assistance. Our revolutionary Cognitive Therapeutics Method uses exciting activities to boost brain health and delay the onset of dementia. Learn more about the respite and live-in care Harrisburg, PA, families trust by calling (717) 540-4663 today and requesting a free consultation with a Care Manager.